Milt Kovak, sheriff of Oklahoma's Prophesy County, has been missing from the bookshelves for too long a time. Readers who have developed a friendship with this down-to-earth hero will be delighted to find the lawman back at the old stand and, as "Kirkus Reviews has described him, "ever more simpatico." Milt has married and has a toddler son. Then one day, Milt receives a terrified phone call from Laura Johnson, an old girlfriend who broke his heart. Laura's teenage son, Trent, went on a religious retreat of some kind with his girlfriend Amanda and has not returned. Since the dubious "church" is in Milt's county, Laura wants him to look into young Trent and Amanda's whereabouts. What Milt finds is more than enough to alarm a mother. On the other side of a fence around the farmland deeded to the cult, Milt sees vultures circling over something in the grass. Hoping it's a cow, Milt dares the barbed wire and a suspicious bull, to find instead the body of Amanda. Milt's investigation is barred at every turn by "Brother Grigsby," his wife, and their mostly female followers (an amazing number of whom are pregnant). Meanwhile, Laura is a shrieking hysteric, and Milt's niece sneaks incognito into the compound to do some detecting of her own. 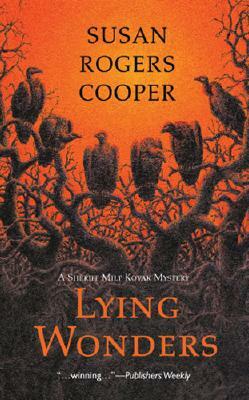 Cooper's stories always strike a fine balance of humor and solid suspense, and her characters are as real as the neighbors down the street, although their antics are more entertaining. Milt Kovak's return is a real treat.